Mayo ICA members at a Nollaig na mBan event they held this year. I was fortunate to have been invited this week to give a talk on the history of Castlebar to the local branch of the Irish Countrywomen's Association (ICA ). The evening went well, and my thanks to Maura McGuinness, Patricia Larkin, and all the membership for their hospitality. It was in preparing for that talk to an all-female audience that I was reminded of how devoid our local history is of women and women's groups, when compared to their male counterparts. In the 400 years I covered, only five women featured publicly and briefly. We know the reason for this was because a male dominated society had structured a degraded role for women which was almost impossible to break from. For those women who wanted to express themselves, the ICA was and remains an important outlet since its inception in 1910. Originally called the Society of the United Irishwomen, the group's aim was 'to improve the standard of life in rural Ireland through education and co-operative effort'. Against the backdrop of an anti-feminist state, the society educated women in maintaining good living standards while also encouraging female participation in public life. Early Mayo branches existed in Ballycroy, Aughagower, and Kilmeena. During the Great War, the society gathered sphagnum moss in Mayo for use as dressing on the wounds of soldiers across Europe. Collection centres were established in Achill, Ballina, Ballyglass, Castlebar, Crossmolina, Hollymount, Rosturk, Mulranny, and Westport. Nearing the end of the war, the Ballina branch was regularly procuring fresh milk for distribution to the poor of the town. The society changed its name in 1935 to the Irish Countrywomen's Association, the 'country' referring not to the countryside but to Ireland as a whole. The new name pointed to an expanded role for the ICA as it now also catered for women living in urban areas. From my own cursory research, the ICA did not have many branches, known as guilds, in Mayo until the 1950s. Where meetings were held, demonstrations were provided in the practical crafts of cushion, lampshade, and clothes making while discussions took place on what a first aid kit should contain. The ICA was also a social club and the annual dinners held by guilds and by the ICA's Mayo federation for all members were a highlight of the calendar. The modernising of Ireland from the sixties onward led sections of society to rightfully expect more from life. The ICA impressed on its membership the benefits that a trained, united body of women could achieve together. Techniques learned during demonstrations were put to use. The Ballina guild took the lead and opened a centre for the sale of produce grown on a local eyesore that they had planted on. Discussions became more social as the women gained confidence among increased numbers of guilds. Debate at the 1954 Mayo federation meeting in Newport focused on the subjects of women jurors and women in the police. The first female gardaí were only recruited in 1959. The ICA grew steadily and by 1966, it had 18,000 members across Ireland but it was not an insular organisation. 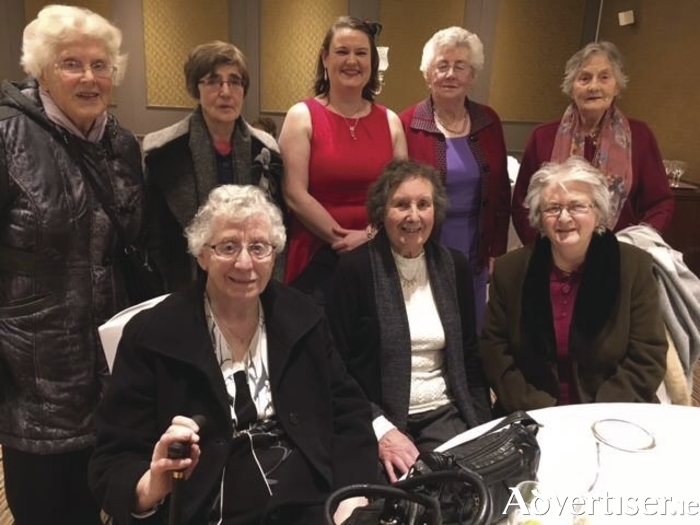 To focus the public's attention on the 1975 Women's International Year theme of peace, the Mayo federation of ICA guilds organised a multi-denominational peace walk in Castlebar. It was also a show of solidarity with the women of the North who were walking in Belfast on the same day and for the same cause. The ICA's period of self evaluation continued throughout that decade as it debated how to remain relevant in a country which was opening up to outside influences and ideas. As part of a programme aimed at shedding its image as 'tea-makers' and to reinforce its role as a socially improving force, the ICA held seminars in each region in 1978. The western regional seminar was held in Castlebar, where the local branch had been set up in 1950. The offensive worked and by the early eighties meetings of 100 members from over 20 Mayo guilds were recorded. At one meeting in Belcarra, a member told the press, "the members are forging ahead into the eighties fighting for human rights". The activities of the ICA were described by an observer as 'practical patriotism' in which moral stands of national importance and practical household advice cohabited. Since that time, the Mayo federation has continued to tackle issues of importance to society as a whole such as the availability of cancer services in Mayo University Hospital. The success of the ICA lies in the variety of services it offers women. Whether as a social gathering, a forum for advice, an educator or an outlet for social comment, the Mayo guilds play an important role in improving society. Page generated in 0.0794 seconds.